The innovative new Jumpking JumpPOD is a trampoline with a fully integrated safety enclosure, the enclosure poles slot directly into the trampoline top rail, completely removing the need for brackets. The Jumpking JumpPOD trampolines are available in three sizes; 10', 12' and 14'. Available with a green surround pad. Includes cover, ladder and shoe net. Tri-Layer socket - the enclosure poles slot directly into trampoline top rail - no brackets! Please note: Orders must be placed before 15th December 2011 to guarantee a pre-Christmas delivery. Hayter Harrier 41 Rotary Lawn Mower with Briggs and Stratton Quantum engine and 7 adjustable height settings. 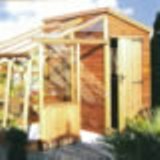 The Security wooden shed is designed for safe garden storage. Security windows, heavy framing and fully framed door make this a strong, safe wooden shed. The price for this quality wooden shed includes free delivery and installation in the Midlands area. We can deliver to other areas.